Focus: To learn what it takes to get on the Google Local Pack so you can start collecting reviews and feedback from people ho used you before. ​The following is the first of many marketing strategies I use to double my website traffic. And it is one of the biggest secrets search engine marketers don't want you to find out. 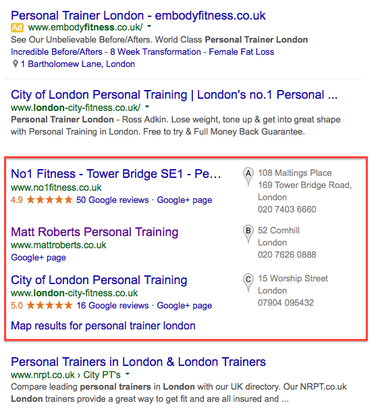 Here's everything you need to know to get your personal trainer website to the top of search results. The Local Pack is the term us marketers use for the location listings, which appear at the top of search results when a user looks for services in a certain location. Without the Local Pack, potential clients may not know where to find you. But with it, you can optimize the number of visits you get to your site. ​Try it now. Search for a personal trainer in your area and be sure to use your location in the search. For example, try searching "Personal trainer, London." See the map and corresponding search results? I'm going to teach you how to get your website there! 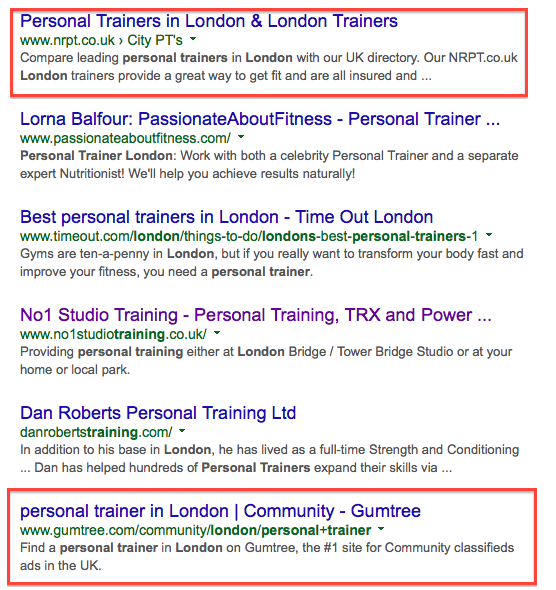 Searching terms that include locations like "personal trainer London" will yield results similar to the image on the right. ​​​When you make a search for anything local, you'll be presented with loads of different types of search results, depending on your search engine, location and device. The results highlighted in red are what an SEO specialist like myself calls the Local Pack. And this is what I'm going to teach you how to rank for. If your business shows up in the Local Pack, it will also appear on Google Maps, on mobile phones and tablets and even when a user doesn't use a Geo identifier. Google is so smart these days, that it can track your IP address and provide location-specific search results without you ever having to enter your location into the search engine. And it's all the more reason to get listed. Why is it so difficult to get listed? There are hundreds of various signals that dictate your position in search results, most of which we have little to no control over. However, Moz.com, a search engine optimization industry leader, provides a good summary of the process to help you rank your personal trainer website. Google My Business Signals - This is your Google My Business page. If you train clients locally, you need one of these. 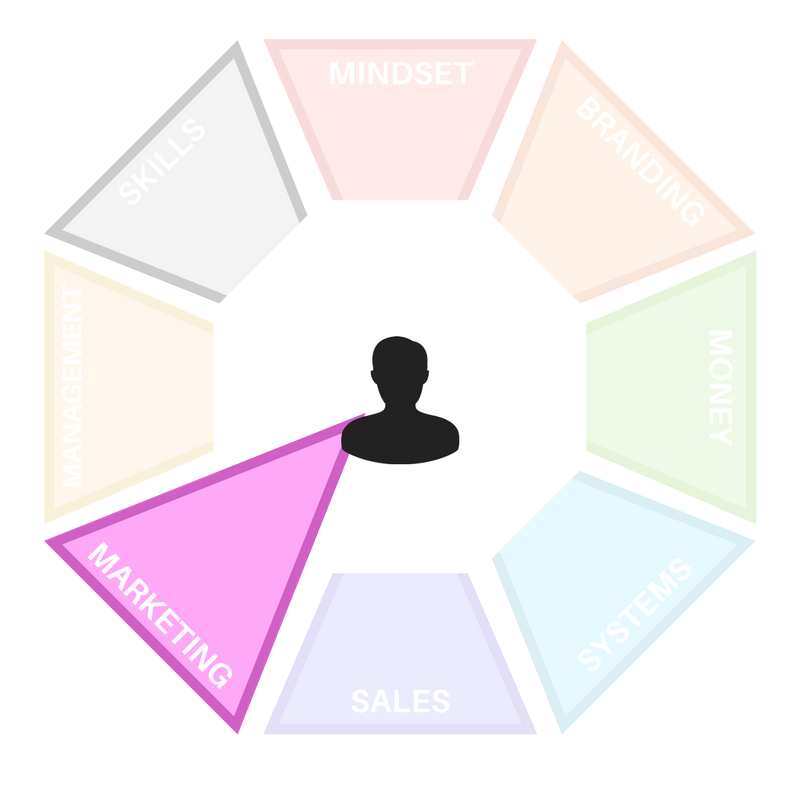 You also need to mention keywords in your business title and categories. External Location Signals - These are other signals that are EXTERNAL to your website, such as the number of other citations you have, how accurate the listings are and other local directory listings. On Site Signals - This is the presence of your personal trainer business name, address and post code, keywords in your page title and the authority of your domain name. Link Signals - These are links from other websites that basically "vote" for your website. The authority of the site that is linking to you, the words they use to create a link and anchor text are all very important. Review Signals - This feature is becoming more and more pivotal. And Google is beginning to favor listings that have more reviews than others. Social Signals - Again, this is another increasingly important factor dictating your position in the local search results. Facebook and Twitter mentions now play a huge role on the position of your personal trainer website. Behavior Signals - This includes activity such as Facebook check-ins, clicks to call and click through rate. Personalization - Make sure to select the correct category within your Google My Business page, add photos and videos and a comprehensive description of your business. How to get your personal trainer website on the Local Pack? ​Now that we've covered the what and the why, let's go through a quick overview of the how. We'll be going into more detail in the next chapter. Optimize your website. I won't go in to this too much, as it's been dedicated to another blog post. But making sure your website is correctly optimized is pivotal for the long term rankings of your personal trainer website. Get a Google My Business page. This is probably the most important step of the process. And the quality of your business page will almost definitely dictate your position in search results, so set aside an hour to do it right. Seriously, do it right. Include videos, photos and actively ask for reviews from your current clients. Search for fans and followers to increase the activity of your page and let Google know you're an active business. Check for other local citations. This is called a citation audit and it's important to ensure that all of your citations are matching. If you have a lot of citations that don't match, then the power those citations have to rank your website is dramatically reduced. Start building other local citations. These should include rich media citations, full of photos, videos and social media citations. We will go more in-depth on this later. The last paragraph of your website. If you don't know what you're doing at this point, then it's definitely worth seeking help from a pro. Optimizing the home page of your website shouldn't be too expensive, but it's worth it for the long term generation of new leads. We don't need to go over this in too much detail, as there are loads of how-to guides out there that fully explain how to build a good Google My Business page. But let's go over the main components. Navigate to the Google My Business page. You’ll need a Google account to get started. Shopfront businesses: For personal trainers that work in a gym or own a space. Choose this option if you serve customers at your business location. Service area businesses: For mobile personal trainers. Choose this option if you serve customers at their location within a specific service area and you want your customers to see your service area on Google Maps. Enter the name or address of your business and select your business if it appears in the drop-down menu. If you don’t see your business listed in the menu, click "No, these are not my businesses or I’ve correctly entered the business." You’ll then be prompted to enter some details about your business. Make sure that you enter an accurate, complete street address and a phone number that reaches your business directly. After you've completed your business information, click "Submit." Verify your business. To make sure that the basic information you've submitted is accurate, Google will ask you to verify it. This process helps them give the best possible information to your customers on Google. On the postcard request screen, make sure that your address is accurately displayed. You can also add an optional contact name to help your postcard reach you. Then click "Send postcard." When you receive your postcard, enter your verification code into the dashboard to verify your business. Make sure that you can directly answer your business phone number to receive your verification code. Click "Verify by phone" to have the code sent to your phone via automated message. Enter the code from the message to verify your business. The number one problem with local citations is incorrect or inconsistent business information. Every single one of your citations needs to be almost exactly the same, especially when it comes to your business details. It's quite likely that you, or someone who owned your training space before you, have already created some citations and that they could be wrong or inconsistent. To find them, simply enter some of your business details into the Google search bar and hit enter. REMIND ME WHAT A GOOGLE MARKETING PACK IS AGAIN! The Local Pack is the term marketers use for the location listings, which appear at the top of search results when a user looks for services in a certain location. WHY IS IT IMPORTANT TO OPTIMIZE YOUR BUSINESS PAGE? If you optimize your Google My Business page, you will rank higher in the search results and that is what we are aiming for, the top spot!